Squire, his dad on horseback and his cousin Louis. Lincoln's face while looking at the calves in the pen. All the men ride out early in the morning and round up all the cattle. Then, they have to sort them into different pens - all the calves have to be separated out. This is my favorite part of the day. There is such a lively feeling in the air. All the rounded up calves. The weather was perfect - warm and slightly overcast with a very light breeze. Hanging out at the ranch house. Squire with his younger brother, Trace. After all the calves are rounded up, they each take their turn walking into the chute. They get flipped on their sides. They are then castrated (if they are bulls), branded, ear-tagged, and given a couple shots of antibiotics. Squire's handiwork - that double "H" looks good! The calves moan and cry for the first few seconds of being branded. You can see smoke rising up from their leathery skin. The smell accompanying the whole ordeal: burnt hair. The first few seconds of being hit with the branding iron. How bulls become steers. . . But, I did brand a steer! That poor calf had more of a quadruple "H" rather than the intended double "H" by the time I was done with him. They kick around quite a bit - getting a good brand is quite the art form, and I'm still a newbie. Me branding with a little help from my father-in-law. What Lincoln thought of it all. Something that warmed my heart - being a new mamma and all - was how the heifers and their little calves called out to each other. During the rounding up, you would often see a heifer looking in the pen for her baby. After the calves are branded and let out of the chute, they all run to their mammas. It's pretty adorable. Here's a good shot of the double "H" brand. I think I just got the inspiration for our blog's brand. . .
Squire and I got away a couple times to ride horses even! It was a blast!. . . once I got my horse to start moving. The first few minutes were a sight to see: me bouncing up and down, trying to kick her sides with my boots as hard as I could, first begging, shouting and then sweetly asking, "C'mon sweetie! C'mon Racer! Let's go! Please?!" Her reactions to all the hubbub were either to stand dead still and blink or to trot back to her pen. It's too bad she decided to make me look good riding and galloping around on horse - once we were well out of the vision of everyone who came branding for the day. We had a couple of nights sitting at the campfire, roasting smores and Starbursts. It was beautiful - the moon was so bright it cast shadows. You could even see the moon in the late afternoon! All settled after a long day. Leaving Paria Monday evening - the rising moon. A bright moon and beautiful evening sky. We loved visiting with everyone. We had a nice visit at Mama Hepworth's grave. Lincoln liked the sand and grass on his feet. And of course, Lincoln had his first horse ride at the ranch during our visit! Here he is, "ridin'" old Pokey. Here's Squire riding with a little help from his daddy many years ago. On our drive home (in Orderville, UT), we saw an Elk farm! I half-expected Santa to pop out of one of the sheds. We even had a nice long visit with Great Grandma (Great Great Grandma to Lincoln) Brinkerhoff and Aunt Sue. We had such a great time. We might just have to get a few cows and horses of our own someday! Love all those pics! I hope one of your kids gets Uncle Trace's hair too! That is some awesome hair! Lincoln is adorable! 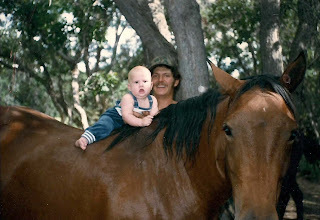 I love the pic of Lincoln on the horse compared to the baby pic of his daddy on the horse. Precious!